Enjoy sugary sweet, orange cream taste with this Big Train orange cream frappe mix! With a name symbolizing strength and constant motion, Big Train has expanded into a global foodservice brand you can trust with a large number of diverse products to choose from. Big Train has become a leader in the specialty beverage mix industry, delivering easy-to-make and consistently-delicious products. Kids especially will go crazy for the dessert-like Kidz Kreamz specialty drink mix. It tastes like a frozen orange cream pop or sherbet dessert blended into a delicious drink. Not only a tasty treat for kids, grown-ups can rest assured that it's low in fat too! In fact, it's also caffeine free, gluten free, trans fat free, and contains no hydrogenated oil. This specialty drink mix also makes a fun alternative for grown-ups who do not prefer coffee. A powder that makes creamy and indulgent drinks, this mix is perfect for sprucing up the menu in your coffee shop or cafe. Offer profitable drinks and satisfy your patrons' cravings for something sweet and new. Better yet, they're easier than ever to make! This orange cream frappe mix can be enjoyed frozen, hot, or blended. Create a fun, innovative orange cream-flavored milkshake without needing to supply the ice cream, or treat your guests to a unique spin on hot chocolate with orange cream flavor. 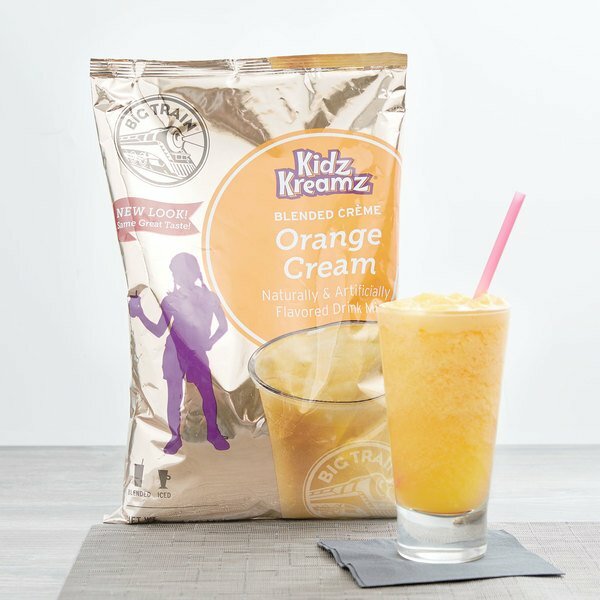 Orange Cream blended frappe is so tasty and love making this drink for the kids on a nice warm summer day to cool off with. This product smells great and has a nice color. The taste is very sweet and delicious (tiny bit of aftertaste though). We currently use it as a milkshake flavor, it mixes very well with the ice cream and milk. Everyone seams to enjoy it! 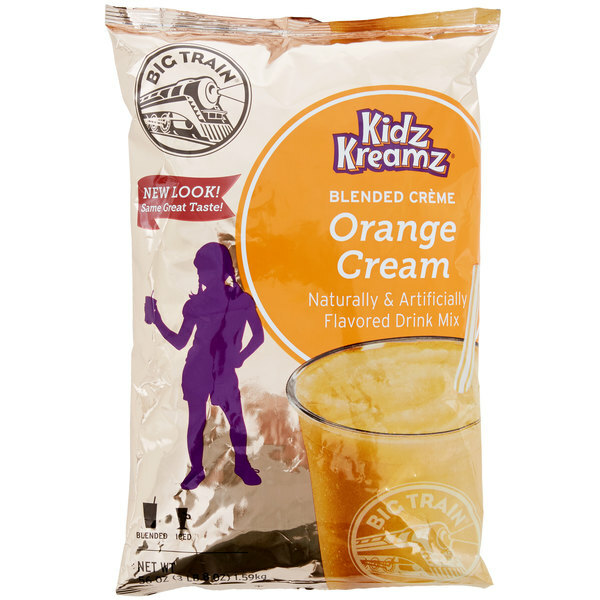 We use the Big Train Orange Cream Kidz Kreamz Frappe Mix in our shop for making frappes and specialty drinks. It tastes like an orange creamcycle and our customers really like it. The Big Train orange cream kidz kreamz frappe mix tastes just like an orange creamsicle. The mix is great for making specialty frappes or milkshakes. A lot of customers like the Big Train Orange Cream Frappe Mix. It does totally taste like an orange cream cream sickle. Will purchase this product again! This is my personal favorite big train frappe. It tastes just like the ice cream push up that I used to get when I was a kid. Its a kids frappe, but more of our adult customers are loving it. I guess it brings back memories when they were a kid. I highly recommend it. We decided to just try this product and so glad we did! It has been a hit for summer! Basically tastes like an orange dream iced cream bar. My sister loved the Orange Cream Kidz Kreamz frappe mix from Big Train. It wasn't my favorite, for me it's was too sweet. It does taste like orange creamsicle but it wasn't my cup of tea! I'm not sure how to begin describing the deliciousness that is this drink... We blend 2 scoops with ice and milk before topping with whipped topping. It screams Orange Dreamsicle! Great product!